Salvitore at Hom told us that Nino’s Pizza on Third Avenue (not to be confused with the plethora of other places with the same name) is his favorite pizza place. It was yet another place where we found the owner working in the shop. Our plan was a quick drive by. Lon hopped out, while I waited in the car, trying to catch a view through the window. When Lon came back, his eyes had widened, and he looked like, he had seen heaven. He told me that every single thing looked so good, he couldn’t buy just 1 slice (which is what we agreed upon). 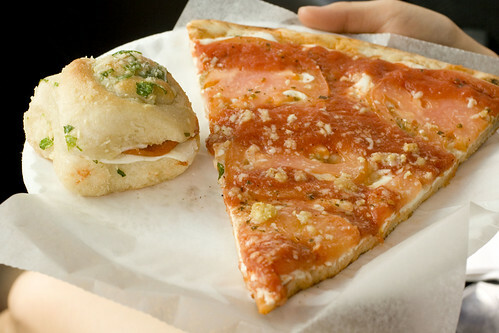 The Sofia Loren slice is made with fresh mozzarella, fresh tomatoes, tomato sauce, and garlic. Ahh…this is what mother nature intended garlic to be used for. The proportions were perfect. You could taste and feel each component in each bite and the slice was gone in a mere minute and a half. 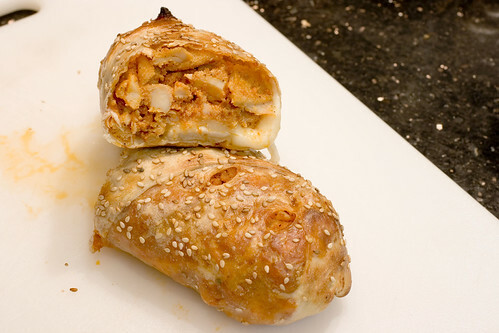 The stuffed garlic knot is a cute little sandwich with pepperoni and mozzarella. I prefer the kind of garlic knots that are golden and crisp on top, but this one was uniformly soft throughout. I can’t complain though. It’s still amazing for $1. The chicken roll was also good, the dough being thinner than usual, allowing more chicken to dough ratio. Our only complaint is that the cheese was only on one side, so that one side was more delicious. The three items totaled $10 and we swore we would be back. There was so much more we wanted to try, mini pizzas, eggplant pizza, vodka pizza. MMM! posted by jessica	at 02:36 PM	Filed under Favorites, Restaurants, Take-out/Delivery. You can follow any responses to this entry through the RSS 2.0 feed. Both comments and pings are currently closed. I’m all about the high chicken:dough ratio!!!!!! That roll actually looks delicious, I can’t stop staring at it! the eggplant pizza would have totally had me smitten, I’m sure! OMG. 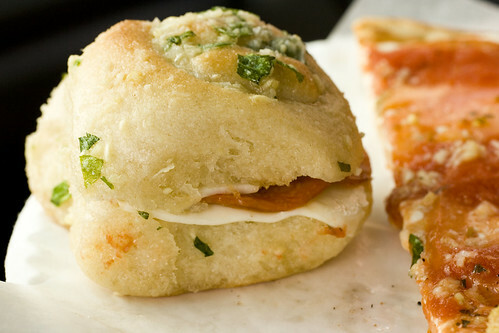 That garlic knot sammie/pizza looks so good! That looks delicious. I’m going to have to tell Scott. Maybe next time you can ask them to cook the garlic knots a little longer with a litte more oil on top to make it crispier. yum yum. I need three chicken rolls and a dozen cute garlic rolls, please. One of our new pizza places here in Great Neck has an a la vodka sauce (w/penne or w/o) that’s delicious. they use fresh mozzarella and the other kind so it’s melty and salty and yummy. LOL! Lesley, your comment almost had me falling off the chair. Trust us, it takes a lot of effort for us to not climb on the counter and eat whole pies. Yum! Those garlic knots look so good.